You’ve probably heard the phrase: “All religions are basically the same”. Regardless of what your answer to this statement is, there is one very interesting aspect that is common across the majority of religions, and that is Jesus. Most religions have something positive to say about Jesus because he is universally highly regarded. They include him in their religious framework. Jesus is considered to have been a spiritual master similar to the Buddha, or to have been a bodhisattva (someone who attained enlightenment but was compassionate enough toward humanity that he refused to enter nirvana in order to help others toward it). Jesus was a good moral teacher. New Age adherents particularly point to Jesus’ teachings on tolerance (not judging others) and love. Many Jewish people would claim that Jesus was a good moral teacher, even though the name of Jesus became sullied along with Christianity in the eyes of many Jewish people. Jesus is included as one of many deities to be worshiped. Where do these ideas about Jesus come from? This list isn’t exhaustive, but isn’t it interesting? There is some sort of agreement that Jesus was an exceptional spiritual leader who should be taken seriously. Clearly many people believe in some way that Jesus represented God or an ‘ultimate reality’ and that his teachings deserve recognition. Note how all of the ‘versions’ of Jesus in each of the religions cited above reference him as a ‘Good Moral Teacher’ or ‘Miscellaneous Deity’. What evidence do these religious adherents base their conclusions about Jesus on? The New Testament has the fullest record about the life and purpose of Jesus. If you are trying to figure out who Jesus was, doesn’t it make sense to at least start that search with the largest collection of historically sound documentation that describes what he said about himself? If everyone regards Jesus so highly, shouldn’t we look to him first to see who he said he was and what the purpose was behind his coming? The New Testament quotes Jesus as claiming to be both God and the Messiah (Mark 14:61-63, Matthew 17:5). He claimed that the only way to God was through Him (John 14:6) and that His death was paying the ransom for many (John 8:24, Matthew 20:27-29). These can’t easily be reconciled with the ‘downgraded’ labels of ‘Good Moral Teacher’ or ‘Miscellaneous Deity’. When it comes to Jesus, your source matters – and so do you labels. He can’t just be whomever you decide him to be. He is who he says he was, or he is nothing. What do you think? 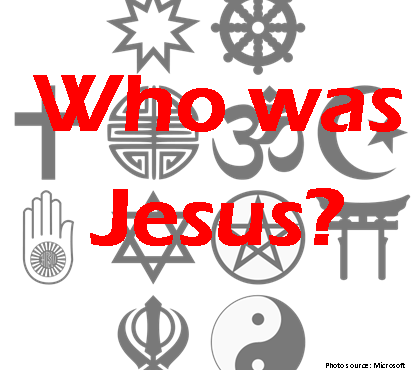 Are you surprised at how many religions make a claim on Jesus? Could he still be only a ‘good moral teacher’ and make the claims that he did about himself?